Opening multiple tabs are not uncommon and at the end, we may be found in a situation where numerous browser tabs are open in single window. Normally, as the number of browser tabs increases, their size reduces. This is OK in most cases where all the newly opened pages have same importance. However, if we want certain tabs large always due to their importance and want to reduce the space limitation, can use one feature called Pin tab. We can reduce the size of the less important pages while keeping important tabs big. This feature is supported in major browsers like Google Chrome and Mozilla Firefox. This tutorial explains how to reduce the size of a specific page by using pin tab feature and reverse the effect once you have fixed the browser real estate problem. After this, the specific tab size will be reduced to the size of favicon. To see the result, see the image below. Here I have used this feature to reduce the space taken by two open pages on Chrome. By using this method you can save a lot of space and will be able to manage more Chrome pages. 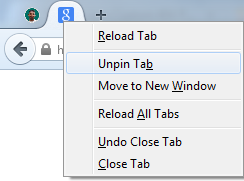 If you want to unpin the above Chrome pages, right click on the pinned tab and click on Unpin tab. The below image will guide you. You can do the same process on Mozilla Firefox too. 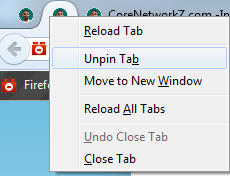 If you have opened multiple Firefox pages on your computer, you can reduce the space taken by lesser important pages by using Pin Tab feature. 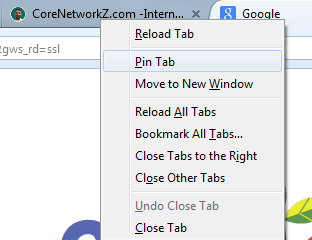 Just like in Chrome, you must right click on the top and select the pin option. Now the page will be moved to the left-hand side with limited size. The image given below will explain the steps. Here in this picture, I am trying to reduce the space allotted for Google tab by using this feature. Once I have reduced the size, those pages will be listed on the left-hand side of the Firefox. The given image will explain it better. If you want to bring back the pinned page into normal size, all you have to do is to right click on it and click unpin option from the right-click menu.